For a start, I thought if he gets paired with Liu Yi Fei, it might be a temporary "revival" of Qin Han and Liu Xue Hua in them having that chemistry and appearance. Maybe Jerry Yan might be able to catch Qin Han's character's feel better than Vic Chou though the latter can still do. My suggestion might be either they get paired for Seagull's Home, Courtyard or Across the Water. Well it might be something if they did either drama which belonged to the original pair then we can have Qin Han and Liu Xue Hua promote them. Esther Liu could be good. Hmmm maybe reenact any of the Qin Han/Lin Feng Jiao or Qin Han/Brigitte Lin moments? Maybe not. Penny Lin- The other Lin. I think she and Jerry Yan can redo any of the Qin Han/Lin Feng Jiao pairings. 1.) Gentaro Kisaragi/Fourze- He's the typical "bad boy" image with the heart of gold, quite naive and wants to be friends with everyone. Again, another unlikely hero and he's pretty much comedic for me. His "Grease" image would remind me of John Travolta's 80s character. Is it me or does he dress too much like the 80s? His determination to be friends with everyone can be a fatal flaw as he can be too trusting which is a weakness in many people. Despite that weakness, I really still like the guy! For me, I do think that his cheery enthusiasm is one of the many reasons why I like him, something I wish I had more of. It's a hard to admit thing but Faiz is really one of the those quite harder to digest shows for me though it's not as bad as Decade. SO far I am enduring it up to episode 27 and I still think there's still some cool drama though it's not as exciting as Agito was and I still like the rainbow world of Kiva better. So compared to Agito and Kiva, it's darker. This is where I think Toshiki Inoue as a head writer needed to brace impact. I would admit I am already getting used to Keitaro and Mari, though I think I'll have to try and endure Delta when he arrives. Yuka's sort of a "laxative" to the show for me which is giving me "mental indigestion". Heck, but I guess this one and I have pictures of her in my Oriental Fanatics Celebrities blog. But as said, I really just thought I am stuck in superficiality as a way to digest this show. I do find this pretty funny. Well Rin's pretty funny herself. I had just finished viewing Super Hero Taisen and seriously, I'll really write a review that's really what I'd call a series of mixed emotions that came along the way. 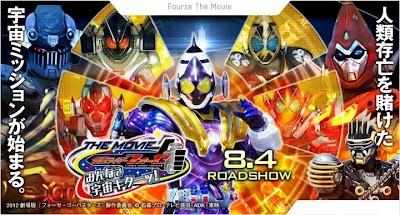 At first, I was pretty excited at the concept of Super Sentai and Kamen Riders joining together, I mean Decade's crossover with Shinkenger succeeded where Saban's Mashed Rider failed but apparently this film is what I'd call as if Shoji Yunemura really teaming up with a bunch of morons to write this and for Shinichiro Shirakura, he just wants to make everything look cool when in fact it's nothing more than childish fan wars in the beginning. This is a lengthy review on how much I really hate this crossover! I Hope I Live Through Faiz! Well I never thought I'd write another review. This time it's SPACE TIME! 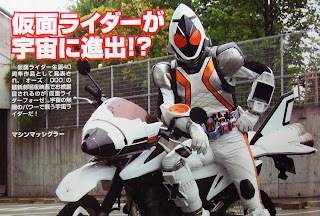 Now it's time to talk about Kamen Rider Fourze- doing a teenager based Kamen Rider right where Saban's Mashed Rider got it wrong. Sure there are people who didn't like this series, yes I agree it has its flaws but moving on. Now the story starts with a great mystery at Amanogawa High School. Gentarou our hero has a "bad boy" image while there's Kengo that geeky guy who seems to have a heart problem and bubbly Yuki. Gentarou wants to be friends with everyone and the formation of the secret organization of teenagers called the Kamen Rider Club. 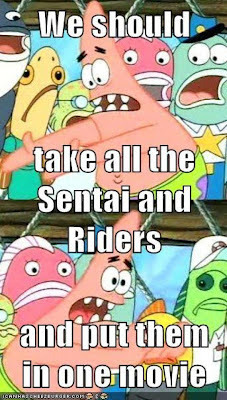 Ha ha, eat your heart out Dex of Mashed Rider! Now where was I? So he's the unexpected hero who one day becomes Fourze to defend the school from the Zodiarts. The Strangest Revelation in Fourze: Tachibana is Virgo Zodiarts? This is the cliche trope of "In order to deceive your enemies, you must deceive your friends first." So I really thought of the purpose of Ryusei had as Meteor. Also I'd dare say this plot is pretty much similar to the Shroud giving Ryu the power to Accel. For one, I thought Virgo was a woman due to having a feminine voice and two, I even thought Tachibana was an android and it just got even more WTF in some way when I discovered all three were the same person. So we know Emoto is both Tachibana and Virgo. So we realize that he has to be such a good actor in his quest to finish off the Zodiarts. What I thought was that Kengo was very forgiving even if Emoto killed the latter's father. What was also surprising was that the "Dark Nebula" was nothing more than a place of sanctuary for those "banished "there as Ryusei and Tomoko return. While I'm currently enjoying this generation's Chinese drama, however I cannot just let go of the idea of watching Qiong Yao. A movie was made on it. If I'm not wrong this was where Qin Han meets Liu Xue Hua who plays two characters- the one with the heart problem and he later falls for the missing twin, also played by Liu Xue Hua! Pretty much, it's a mystery to the characters Liu Xue Hua plays in here. I guess this should get a remake soon with Jerry Yan and Liu Yi Fei playing the characters of Qin Han and Liu Xue Hua. Hmmm it might be nice to see Qin Han and Liu Xue Hua act as parenting parents- Qin Han as Jerry Yan's father and Liu Xue Hua as Liu Yi Fei's mother or Qin Han and Liu Xue Hua as Jerry Yan's parents and Bridgette Lin as Liu Yi Fei's mother. Now I wonder if we can get Joan Lin to also play a part after her long retirement. 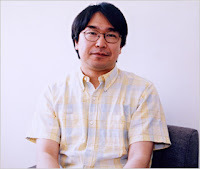 How I Assume Naruhisa Arakawa Would Have Written Kamen Rider Kiva? I just thought he might actually give Wataru a better buildup from the time he's "allergic to the world" in his mind then he might make it a little slower to give it good development. Well, he might even try to examine his past funny characters and then try something new before making Wataru come to life. For Nago, he might make Nago better than he was at Kiva. I didn't have much complains about Nago since I myself can think like he does but with Arakawa, I think Nago might get a more unique personality than being a poorly done Gai Yuki rip-off. How Kamen Rider Agito Improved Kuuga's Bright Start for Kamen Rider? So I'm done discussing about Kuuga's starting the revolution. So I can't even call Agito perfect but it did manage to really help strengthen the revolution that Kuuga started via Toshiki Inoue who sadly later didn't write works as good as this one. =( Moving on, what do I say really made Agito improve where Kuuga left of with some diamonds unearthed? Kuuga started the bounty, Agito did the finishing job on the remaining diamonds. Vanness Wu vs. Vic Zhou: Who's the Better Policeman? Vanness Wu first had his police script in Dragon Squad. So far I didn't enjoy much of his character being poorly developed (in my opinion) and it was more on chases, chases and more chases. But that time, Vic Zhou didn't show much improvement then. Getting past Sky Runner, Vanness Wu takes the major challenge of being a cop. I had my thoughts on this film, nice choreography, intense plot but for me, it's not really much. 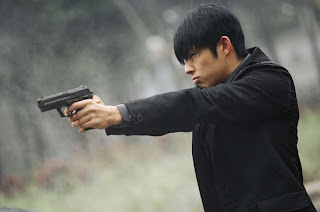 Vanness Wu's not a terrible performer but he's just really not that good in his role as Officer Wang. Moving on- I really thought this film had a great beginning but had some very bad stuff in it that I'd like to raise. So where do I start? Now it's time for another review. So this is one movie I'd say maybe Yasuko Kobayashi would like the concept it with Wong Jing's writing. So far, this film is what got me pretty mixed since I'm starting to dislike time travel plots after seeing Kamen Rider Den-O. Moving on, it's the year 2080 and he travels back to 2020 to stop a band of criminals. Andy Lau plays the role of a cyborg from the future which gives the impression of both Robocop and Terminator. Zhizhao is a detective from the future who loses his family namely his wife Mei Li (played by Fan Bing Bing) and Kiki (played by Xu Jiao).